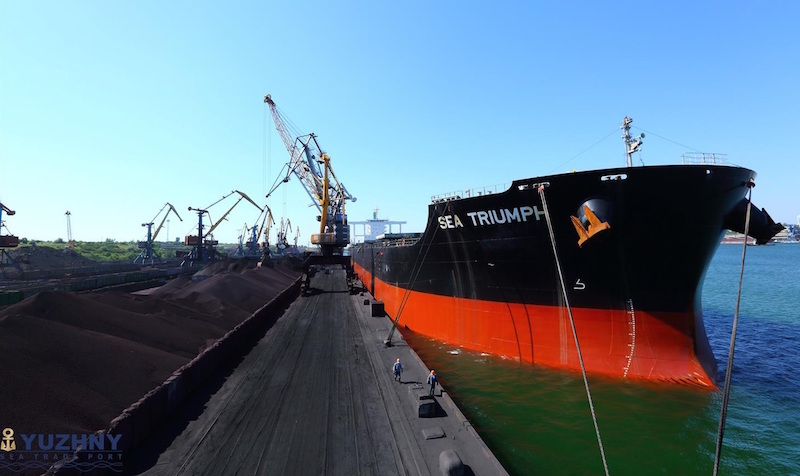 The port workers of Sea Commercial Port “Yuzhny” handled cargo with 102% result in the first quarter. In the period of January – March, the state stevedoring company handled 3,05 mt of cargo, 73% of which made up export cargo. The greater part of the handled cargo made up ore (1,87 mt), coke coal (331,6 thous.t), pig iron (257,9 thous.t) and DRI (250,2 thous.t). The number of vessel calls rose by 29%. “Due to successful activities in March, when the cargo turnover was 1,265 mt (+28% to the plan), the balance was achieved and according to the results of the quarter the target was exceeded as well as the results of 2018. The export cargo (+25%) and transit (+16%) of iron ore set the highest growth rate. 63 bulk carriers were handled, half of which was large-capacity vessels Capesize and Panamax. On average, Sea Commercial Port “Yuzhny” handles 40 thous.t of cargo and about 500 of rail cars per 24 hours. Port sustainability is to be kept during the year”, – said Anatoliy Yablunivskiy, acting director of Sea Commercial Port “Yuzhny”. It will be recalled that, in 2018, the cargo turnover of Sea Commercial Port “Yuzhny” was 12,3 mt. The stevedoring company handled 730 thous.t of cargo more than in 2017, but 1 mt less than it was planned for 2018. The port accommodated 212 vessels, a quarter of which was large-capacity vessels with DWT of more than 175 thous.t. “Sea Commercial Port “Yuzhny” is located on the north-west coast of the Black Sea in the nonfreezing Adzhalyksky estuary and it is the deepest port in Ukraine. The company provides a wide range of loading & discharging services, storage and related works; it handles bulk, general and break-bulk cargoes. Scheduled cargo delivery and cargo handling are effectively performed due to the convenient location of the railroad station “Beregova”, developed infrastructure of the road and rail ways. The company operates five deep-water berths, two of which are dedicated to handling of Capesize vessel up to permissible DWT. Annual cargo turnover of the company is 15,07 mt.